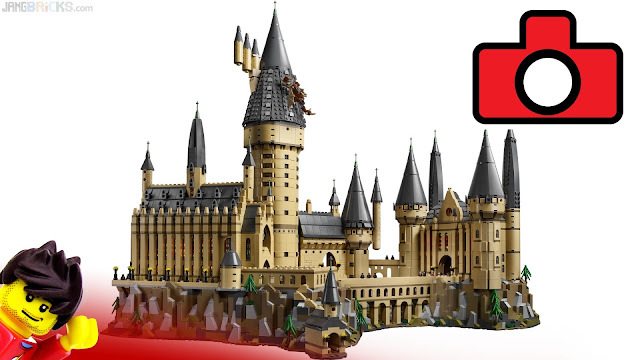 Video - Quick look: New LEGO Hogwarts Castle photo walkthrough! I'm happy with how it turned out for an initial effort, and hope to refine & better personalize the idea in the future while also dramatically improving my efficiency so I can put these out somewhat frequently without noticeably impeding content on the main channel. Oh, and the Hogwarts Castle itself. Yeah. It's pretty proper. Check out the vid. Ah, honestly I feel this echoes of what a ton of other Youtubers are already doing, and it's never as good as a blog where you can read and look at your leisure. Dilutes the 'quick' channel in my opinion. Precisely why I've stayed away from this sort of thing for so long in spite of so many viewers wanting it, and also why it's not on the JANGBRiCKS channel. You can count this viewer [vjl323 and whitesquirrelbooks on youtube] as one who doesn't like these kinds of "reviews" either - talking about a photo as the VO describes what they see and think. I like hands on reviews because just looking at box art really, IMO, doesn't give someone an honest opinion of the set. Being able to build it, and hold/feel it, a reviewer can be a lot more thorough and sincere. But I suppose my age [i'm a touch older than you, Jang, born in '72] appreciates the kind of reviews you do on your main channel and steers clear of quick stuff. Yes, there are only so many minutes in the day [and using them wisely is a goal i try to make each day], but I would much rather watch your quality reviews that go into detail, than to see photos of box art and hear someone talk about them. Quality over quantity. I do understand the need for the quick channel - sometimes one may just want an executive summary of a set and not want the details; but to me, the details matter, and if I'm going to spend money on a set, I want to know as much about it as possible beforehand. I'm Seppe, I'm 13 years old and I'm from Belgium. My brother, my father and I have a big Lego City on the ground. Now we want to put it on tables just like you and many others, so we can put other things like Lego Minecraft and Lego Kingdom underneath our Lego City. We already have the tables but we don't find any smaller tables for underneath the big tables (with the Lego City on) I have seen on your Youtube Channel that you have big tables for your city and smaller tables for things like your 'under the sea'section... Can you pls say where you found these little tables?! He simple uses shorter legs for the tables.